A blast from the past that fits my "Line" theme. I shot this image with Fuji Superia 100 in late 2004 but I have never been happy with it in colour. 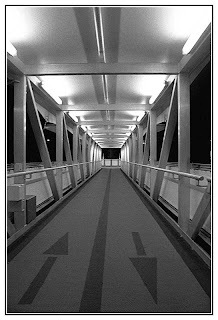 I thought that I would play with the scanner, desaturate it and let the graphic elements shine in black and white. If you are wondering, it is taken from the top of the walkway at the Regatta Hotel Ferry Stop. It is not my usual type of shot, but it is sometimes interesting to revist early frames to see how your style changes over time. I hope you enjoy. OK, so the subject-based theme that I have decided to explore is "Brisbane Doors". 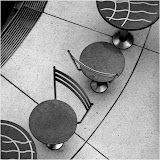 Below is my first posting of an unknown number in the series. 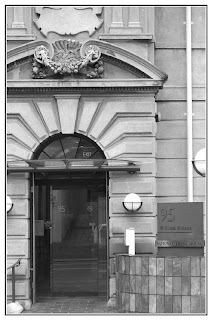 95 William St is now the home of the National Trust in Brisbane and the building has been sympathetically rejuvinated and the enterance is particularly striking. This shot, like my two previous postings, was taken last week early on the rainy morning using the same film and camera body (with the Tamron 135mm). This was the second last shot on the roll and taken after the batteries went flat, luckily the OM2sp has a mechanical mode that allows shots be taken at 1/60th. I guessed the exposure and adjusted the aperture accordingly - you can't do that with a digital! This is another image from the same roll of film as my previous post (ie OM2sp, zuiko 50mm f1.8, FP4 @ 200). I think that over the next little while I will take a leaf from Martin's book and try to pick a theme or two to explore in greater depth, along with my usual achitectural stuff. One theme will involve a strong element of design–line–the other I am yet to settle on, but it is likely to be more subject-based, like "Doors". My chosen image obviously fits with the former theme. 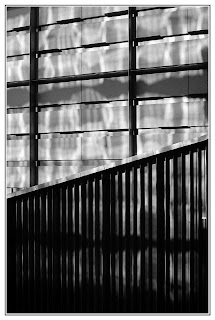 I particularly like the way that the wall has strong lines, and that the reflections from another building add a different dimention that complements the overall effect (no manipulation to the image other than a little sharpening and 180 deg rotation). Like Martin, I too have shot a roll this week with more than one useable frame. 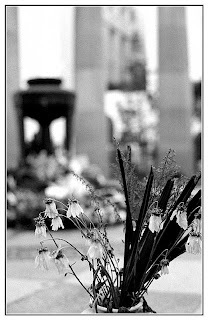 I decided to post these two photos as my final of a series that I have done of the ANZAC Memorial. I have been detouring past the site every other day to see what changes. Someone must have left a small vase and posy over the weekend, but by the time that I saw it on Monday the heads of the flowers had bowed, seemingly in respect of the fallen. I took this low perspective shot to get the flame in the background (OM2sp, 50mm f1.8 Zuiko, FP4 @ 200). 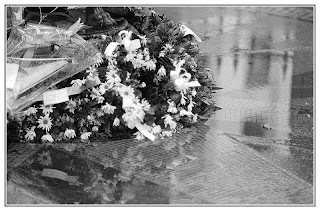 A couple of days later I passed the memorial again, but this time during light rain (yes, apparently it does rain in Brisbane very occasionally). It was quite dark and I had with me a Tamron 135mm f2.5 (same camera and film), so I shot with it wide open and hand-held. Although the result is not tack sharp, I quite like the paw as a subtle reference to the flame and the reflections of the flowers with the mosaic behind. This week has proved quite fruitful, two acceptable images out of twenty-four! 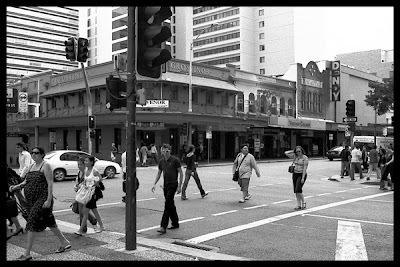 This and (Brisbane Streets) General Post Office were part of a roll shot wandering around the city during my lunchbreaks. Whilst I'm certain there are literally thousands of great shots in every street block, unfortunately I sometimes find it difficult to identify the unique combination of factors that might lead to the capture of one! (Article originally posted 10th April 2007), so you saw yourself in an image on a web page? Some interesting links to the Arts Law Centre of Australia site concerning privacy, unauthorised photography on the Internet and legal aspects related to the management of a blog. Apparently because Australian State and Federal law currently contain no mechanism guaranteeing otherwise, in this country the right not to be photographed whilst in public does not exist. That is not to say that defamation and damages may not be awarded against a photographer as a result of misrepresentation and commercial profiteering. I believe however the commercial aspect excludes a monetary transaction based on sale of the image itself as a legitimate art form. Irrespective of this apparent freedom however, I would like to believe that as photographers, irrespective of the genre to which to which we subscribe, there is a responsibility upon us to ensure the human condition is always documented with the appropriate blend of sincerity, dignity and authenticity. 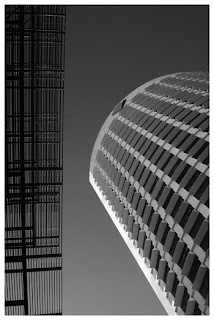 I was struck by the contrasting styles between the metal work attached to the side of the Queen's Plaza building on one side of the road and the concrete monolith of the Commonwealth Bank building on the opposite side. I think it was the interesting juxtaposition of patterns that initially caught my eye and I think also the passing resemblance to the 1 Eagle Street image I took in December 2004. 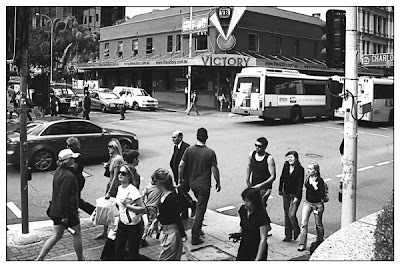 Another photograph in the informal "street corner" series, this intersection is on the southern edge of the CBD close to the river. George Street itself (running left to right) is characterised by a predominance of local, state and federal government buildings which are the workplaces of literally thousands of public servants. This viewpoint however has captured some of the older, non-government buildings including the Grosvenor Hotel and Dendy Cinema.